The Curves adjustment is without doubt one of the most potent tools available to photographers today. It offers precise control over the tones in an image, with a graphical user interface that does a superb job of displaying the exact nature of any pixel pushing that might be taking place. The difficulty, though, is that for anyone taking their first look at a Curves adjustment, said graphical user interface can be distinctly counterintuitive. There is just no apparent connection between a histogram, a piece of virtual graph paper, a conspicuous diagonal white stripe and any sort of useful photo-editing implement. Photoshop, for one, does an excellent job of making sure that newcomers to the application find the tool altogether confusing – or at least, I did! I suspect that the bulk of the confusion that surrounds the Curves adjustment panel in Photoshop has its roots in the absence of any meaningful labels, labels that might indicate what each axis of the graph represents. For the record, the horizontal axis at the foot of the chart, with a gradient bar transitioning from black to white, is the input axis, while the vertical one, with a gradient bar of its own, represents the output. 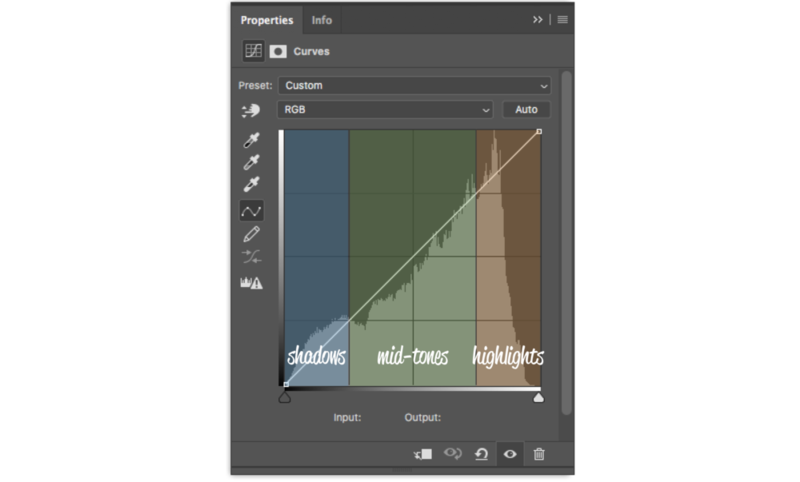 The anatomy of Adobe Photoshop’s Curves adjustment panel. The input axis serves as the foundation for the adjustment panel’s histogram and, in true histogram fashion, the plot shows a distribution of luminance values for each and every pixel in the image. As the gradient bar suggests, the far left-hand side of the histogram represents how many black pixels make up the photo and the far right, the number of white pixels. It goes without saying, then, that every other pixel with a luminance value lying between that of pure black and pure white, finds itself plotted somewhere in the mountain range. To make the implications of this distribution more manageable, it can be useful to think of the histogram in terms of zones instead of as individual pixels. Broadly speaking, the Curves adjustment’s histogram can be divided into three luminance regions: shadows, mid-tones and highlights. To make a Curves adjustment useful to those with a taste for photo manipulation, it is necessary that a means exists to map the input luminance values of a photo to some new output luminance values – enter 'The Curve'. The best way to wrap your head around the curve is with an example. 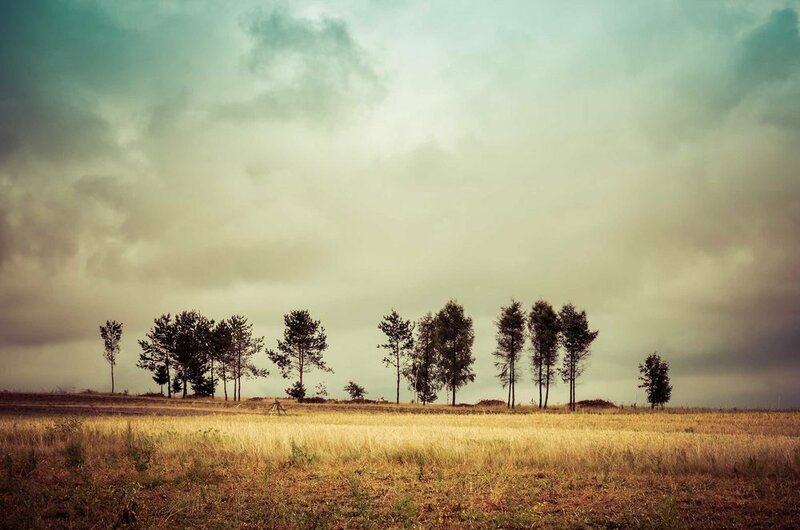 The photo below, for instance, is a gloomy little thing, which is great when you're after a dose of drama in a scene but is probably not to everyone's taste. To brighten the image up, what we need is to increase the luminance values of its constituent pixels. However, instead of merely indiscriminately raising the luminance values of all the pixels in the photo, it would be in our interests to protect the lightest and darkest ones from the potentially detrimental effects of our fiddling. It is often the case that only pixels which find themselves in the mid-tones require adjusting. To achieve this selective pixel brightening, all we need to do is place a marker by clicking in the centre of the white soon-to-be curve. At the foot of the adjustment panel, input and output values appear, two numbers that are, at least conceptually, pretty important since they give us two useful insights. First, they show us that the luminance of the input pixels represented by the marker's position on the curve has a value of 128, precisely in the middle of the graph and in the centre of the mid-tones region too. Second, it shows us that, as things stand, no adjustments have been applied to the image since the input and output values still match. Begin inching the marker up, though, and the situation begins to change rather rapidly. The image becomes increasingly brighter the higher you lift the point, the values at the base of the adjustment panel telling the story. In this example, input pixels that initially had a luminance value of 128, have now been altered, leaving them with a new, adjusted output luminance value of 180. It is this increase that makes the image appear brighter but, importantly, most of this brightening effect occurred in the mid-tones. Follow the curve on either side of the marker, and you will notice that the degree to which the luminance value of the pixels has been increased, lessens as you approach the plot’s extremes. In fact, in this simple example, the luminance value of the pure black and pure white pixels remains unchanged as the white and black set points have maintained their original positions. But, as useful as the Curves adjustment panel is for illuminating dull images, a single-point adjustment is only the tip of the proverbial iceberg. If, for some outlandish reason, you wished to increase the contrast in the sample image while still preserving the black and white pixels, then a two-point adjustment will do the trick. One adjustment point can be used to reduce the luminance of the pixels in the shadow region of the histogram and another to increase the luminance in the highlights. Furthermore, a third central point may be used to anchor the curve, keeping the whole thing symmetrical, though its use in this scenario is entirely optional. In practice, there are no limits to the number of adjustment points you can add to a curve, although things do tend to quickly spiral out of control once too many adorn the stripe. Also, the real-world application of a Curves adjustment is primarily driven by feel rather than by an obsession with the numerical input and output values. Instead, the thing to take away from this article is that no matter how many points you lay down or how you go about working out where those points should be, they all behave in precisely the same manner. Each adjustment marker simply maps some existing input pixel luminance value to some new, adjusted output value. Get a firm grasp on that concept, and you will be poised to unleash the extensive power of the Curves adjustment.